There's an omnipresent fear that our guests will snicker at the slow rate at which your food cooks well as the cheap, worn out exterior of your budget grill. In this article, we'll examine what the real difference is between a top-of-the-line BBQ to a more modest offering and discuss why an inexpensive grill might still suit your needs. What Are You Paying For, Really? * "+" indicates there may be a warming rack or side burner. This grill is a bit more complex to assemble than our other recommendations. We suggest having a helper and allocating about two hours to put it together. The instructions are occasionally fuzzy but not incomprehensible. Char-Griller offers a simple machine here, which serves as the baseline for our recommendations. It's durable, made from high quality stainless. The grates are porcelain coated cast iron, meaning that they're a bit non-stick without any prep and incredibly non-stick after you season them or just use your grill for a while. There's a thermometer built into the lid to help you guess how hot your grill is and adjust cooking times. Finally, two wing shelves serve as a place to rest plates or tools while you cook. It's big (over 400 square inches) and it's way more powerful than your g﻿﻿as ra﻿﻿nge (40,000+ BTUs). First, one of the side shelves has a lower powered burner for keeping food warm or performing low powered grilling jobs. This is situationally very convenient, although I'm a fan of just running a plate to an oven on warm if I need to. 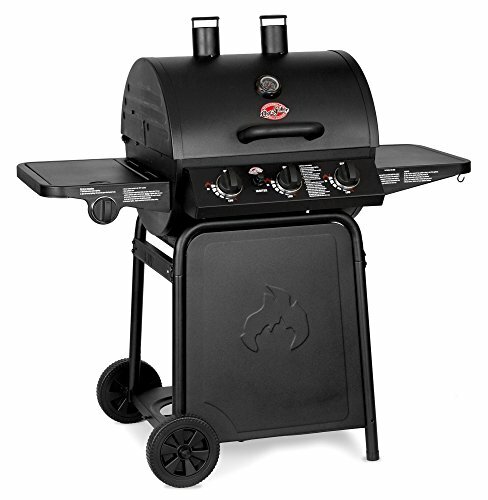 The grill is a matte black barrel construct, with smokestacks and simple trim. It looks more rugged than our other recommendations. The drip tray on this unit is easy to clean and remove. 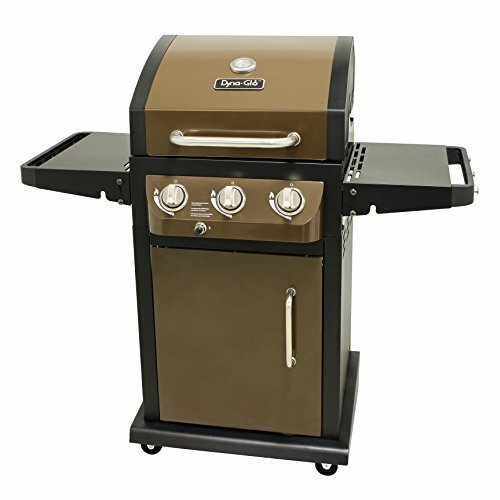 There's a 1-year limited grill warranty and a 5-year limited burner warranty. Consider supporting this with an additional warranty or repair plan. 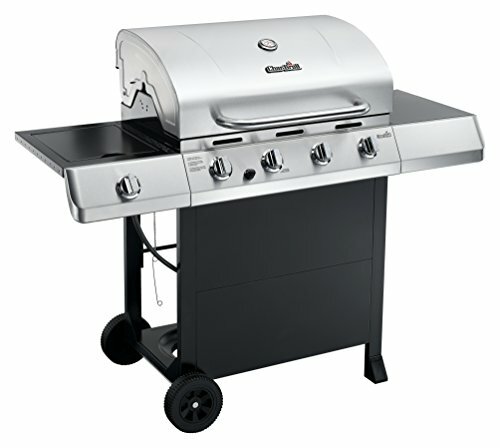 This Char-Griller 3001 is an excellent baseline to use when shopping for a mid-range grill. Assembling this grill is fairly easy on your own given an hour or so. All the difficult parts come pre-assembled so your job is just to erect the stand and place the grill on top of it. We feel that the aesthetics of other grills are more pleasing than the Dyna-Glo, but the quality of life features more than make up for it. This unit features a removable grease tray that funnels grease into a separately removable grease cup for extra easy cleanup. The side shelves fold up to make more space in your yard while you're not using them. The electronic ﻿﻿ignition is powered by a single AA battery that's included in the package and a total breeze to change. The cooking surface is slightly smaller than our other recommendations, and the BTU output is trivially lower. It's unlikely that you'll notice a difference in heat (a 9 on the Char-Broil equates to a 10 on this grill), but the few extra inches of cooking space and side warmers on the other two grills might mean the difference between cooking a small party's worth of food all at once or over two sessions. If this grill was a few inches larger, it would be our top pick for sure. As it is, it's perfect if you're willing to have a slightly smaller cooking surface. This grill can be assembled solo in a couple of hours. The knobs and hookups might take some fiddling to get in to proper place. Some of the interior metal pieces come with sharp edges so you may want to consider using BBQ gloves. However, they're thick durable pieces straight from the factory. You'll probably want to get the cover designed specifically for this Char-Broil grill because it's so darned beautiful. The burnished steel angles make for a very showy bit of backyard equipment. The 40,000 BTU of main grill output is more than enough to sear the pants off of anything you need to cook, and it handles quite well on the lower settings. There's a limited manufacturer's warranty provided by default: it requires you to save your proof of purchase ("retain your sales slip or invoice") and it covers "perforation, manufacturing and material defects only" on the stainless burner for 5 years, the firebox and lid for 2 years, and all other parts for 1 year. Consider purchasing an additional warranty or repair plan. A subtle inconsistency that helps fuel positive buzz for higher end models is the cost of covers, repair and extended warranties relative to the cost of the grill. A custom cover for an inexpensive model may be 1/5th of the purchase cost, while the same cover offered for higher end one may only be 1/10th. The same goes for repairs: if you've replaced the grease tents once a year for five years, you're looking at 1/3rd of the purchase price of the first grill and less than 1/7th of the price of the second. Properly maintained, these grills might look the same at the end of those 5 years. If the family that purchases the cheap one chooses to stop repairing it because "they might as well just buy a new grill," however, it won't last as long. Just because something is more expensive doesn't make it better. It's important to do a side-by-side comparison between a top rated expensive model or two and some of the cheaper ones you find to see what you're actually paying for. In a lot of cases, the features you care about are just as good in the mid-range grill, if not better. 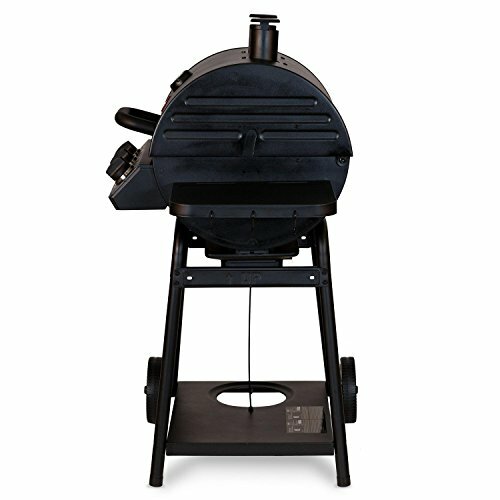 Our top budget grills feature custom covers, temperature gauges, beautiful exteriors, and blisteringly hot burners. So what makes the high end grills high end? Grills live outside in the cold and the rain, and in the hot and windy parts too. They're liable to rust, they handle explosive gases under pressure and they produce temperatures of hundreds of degrees while they cook. Because of this, they're liable to only last four to six years. If you want your grill to last you should look at purchasing a grill with a good brand, good durability, and a strong warranty. Not all high-end grills have all of these features; some of them are just rip-offs. By carefully examining these factors, you can determine if a grill is worth its sticker price. If grill A is listed for twice as much as grill B and they have similar cooking features and aesthetics, grill A needs to be constructed twice as durably, have twice the warranty, or have a brand that's twice as reputable as grill B for it to be worth it, in our opinion. Did you enjoy this guide? Let us know in the comments and tell us what your favorite inexpensive grill is.